Syed Abdul Hasan ‘Ali Nadwi (1913-99), an eminent Islamic scholar, thinker, educationist, and reformer of the twentieth century, stood tall across the entire Islamic and Arab world with his sheer faith in Islamic, works, reforms, courage, and love for mankind. A gifted speaker and a prolific writer, he wrote more than 50 books and hundreds of papers on history, literature, and theology in both Arabic and Urdu. Syed Nadwi’s literary efficiency was par excellence, having envious profundity in Arabic and Urdu. His Ma Dha Khasarul’ Alam ba Inhetatul Muslimeen is considered as one of the best books of the twentieth-century Arabic literature. This biography by his close associate and newphew is a vivid account of Syed Nadwi’s multifaceted personality and his influence among Muslims across the globe, Arab and non-Arabs alike. He was well known for his wisdom, intelligence, foresight, and rapport with numerous intellectuals, religious and political heads in the Muslim world and elsewhere. As an exemplary personalty, he stood firm against the 1975-76 birth-control policy of the Indian government and played a pivotal role in getting the Muslim Personal Law passed in 1985. This volume portraits Syed Nadwi’s vision, mission, organizational ability, determination to face challenges, devotion in introducing the essence of Islam to the new generation Muslims. It should entice all new generation students of Islamic history and literature across nations to reform themselves and be a catalyst in Islamic ethics, manners and vision of a modern Islamic world. Syed Muhammad Rabey Hasani Nadwi is currently (since 1999) the Rector of Nadwatul ‘Ulama. He was born in 1929 and educated at Nadwatul ‘Ulama and Darul ‘Uloom, Deoband. From 1949, he has been serving Nadwatul ‘Ulama in different capacities. He is the newphew of Syed Abul Hasan ‘Ali Nadwi. As Dr. ‘Abdullah ‘Abbas Nadwi has written in the Introduction of this biography, Syed Rabey Nadwi was the most trusted associate ad confident of Syed Abul Hasan ‘Ali Nadwi. He is a Trustee of the Oxford Centre for Islamic Studies, the President of the All India Muslim Personal Law Board, a Vice President of the Muslim World League, a founding member of the World Forum of Islamic Literature, the President of Religious Education Council, and a patron of Payam-e-Insaniyat. He has to his credit about 30 books in Arabic and Urdu. A Prominent scholar and former judge of the Supreme Court of Syria was asked in a radio interview, "Which is your most beloved city?" He replied, "My home city of Damascus and then Lucknow, the city of my friend Sheikh Syed Abul Hasan 'Ali Nadwi", Similarly, a prominent scholar of Iraq once remarked to an Indian official, "We know India due to Lucknow and we know Lucknow due to Sheikh Syed Abul Hasan 'Ali Nadwi". These and similar compliments, which were heard in the Arab world, speak about the international stature of Sheikh Nadwi. How did Sheikh Nadwi develop into such a personality? We need to look at the factors that contributed to the formation, men to ring and nurturing of his personality. The factor that stands out most is the environment of his home and family. On one hand, it was very distinguished in religiousness, nobility, morality, literature and education. On the other hand, it was deeply involved in India's struggle for freedom from the British rule. Sheikh Nadwi's grandfather Hakeem Syed Fakhruddin Khayali (d. 1908) was a poet and a scholar. His father Hakeem Syed 'Abdul Hai Hasani (d. 1923) was a historian and a biographer. His brother, Dr. Syed 'Abdul Ali Hasani (d. 1961), was an eminent physician and a fusion of the old and new. His mother (d. 1968) was a pious, softhearted and learned woman credited with a published anthology of poems. His sister was an author. Above all, his forefather Syed Ahmad Shaheed (d. 1831) was a true example of ruh-baan billail wa fursaan bin na-haar (monastic during night and warrior during day). Sheikh Nadwi was a fusion of numerous personalities of extraordinary caliber and an amalgamation of their distinguished qualities. He was a man of literature and composition. His patriotism for his country, India, was unwavering. He was always eager for the country's progress and prosperity. He always strove to create an atmosphere of mutual love and brotherhood among various communities. He was always eager to see Muslims excel in education and morality. He had seen the period during which India was a British colony and had closely witnessed the brutalities and injustices of that regime. He had seen how savagely Indians in general and Muslims in particular were treated by the British rulers. This had created in him an intense yearning for independence and freedom. So when India gained Independence, he strongly felt that every community must have full freedom to preserve its identity and to live according to its own religious beliefs and values. He also felt that an environment must be created that fostered love and respect among different communities and encouraged them to live in peace and harmony with each other. Thus when he entered public life, he started working on two fronts: (1) education and character building, and (2) social reforms. Allah had blessed him with very powerful pen and speech. He used both of these skills effectively to promote educational and social reforms. Using public platform, he reminded masses of their obligations towards their community and country. He approached influential people and leaders individually to remind them to serve the country and contribute to its progress and prosperity. He always appreciated and supported those who were engaged in any kind of service to the community, country or humanity. His approach was simple and clear and was purely based on well-wishing for all. That is why he was respected by leaders of different communities and affiliations and they all saw him as a sincere and kindhearted person. He was a distinguished scholar of Islam. He enjoyed tremendous amount of respect and affection among Muslim scholars all over the world. He was originally from Rae Bareli, Uttar Pradesh, India, but was brought up and educated in Lucknow which is the capital of the State of Uttar Pradesh, India. His role as a leader and thinker in dealing with the educational, social, and religious affairs of Muslims and his contributions in these areas are widely recognized. In addition to taking special interest in the affairs of Muslims, he was also committed to the welfare of the entire country and all communities. In the area of education, he concentrated mainly on Nadwatul 'Ulama (an Islamic institution of higher learning in Lucknow, India) which was established about a century ago in order to bring together the best of both the traditional and modern education. During the last four decades under his leadership, Nadwatul 'Ulama gained the stature of an internationally recognized and respected institution. He also established an organization known as the Deeni T' alimi Council for the purpose of ingraining a solid foundation of Islam in Muslim children in the very early stage of their education so that they could protect their faith while living in the Hindu- majority environment of secular India. He remained head of the Council until his death. On the social and religious front, Sheikh Nadwi remained actively involved in the efforts of the All India Muslim Personal Law Board (AIMPLB) which was established in 1973 for the purpose of protecting and preserving the Islamic shari'ah (code of conduct) in India. After the death of its founding president Qari Muhammad Taiyab Qasmi in 1983, Sheikh Nadwi was appointed the president and served in that capacity until his death in 1999. He played a pivotal role in tackling key issues faced by the Board during his tenure. While actively leading efforts in India, he also rendered his services to Muslim countries and communities outside India. In addition to being concerned about Muslims, he also took deep interest in the welfare and betterment of the entire humanity. For this very purpose, he started the movement known as Payam-e-Insaniyat (Message of Humanity) in which he involved good-hearted people of all religions and denominations and reminded them about their obligations to the country and humanity. Thus he served at all levels - community (Muslims), national and international - and received acclamation from all corners. Wherever he saw a need, he tried to do his part. Wherever he saw some weakness or slackness, he boldly voiced his opinion. He did not hesitate in presenting correct Islamic perspective of an issue and safeguarding the interests of the millat (Muslims). His approach was such that he would give due respect and recognition to the person with whom he was speaking and would use the language that was most appropriate to the position and status of that person. Even when he criticized someone, he did so in a loving and respectful manner. That is why even his harsh words were well received by others. Whenever he got an opportunity to talk to leaders and influential people of a country, he presented his viewpoint with no motive other than that of well-wishing and without any material gain in mind. Details of such encounters can be found in his autobiography and other writings. 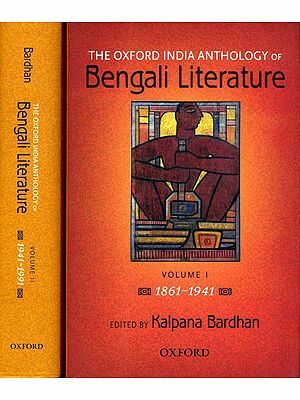 His scholarly and thoughtful writings gained immense popularity both inside and outside the Indian subcontinent, especially in the Arab world. Some of his books were recognized in the Arab world among the best three or four of the century. He presented literature as a tool that could be used to serve Islam and humanity. This role of literature was recognized by the Muslim world and consequently an international organization known as Rabita al-Adab al-Islami al-'Alami (World Forum of Islamic Literature) was founded and he remained its head until his death with the headquarters in Lucknow. Not only was he a vocal champion of this cause, but he himself produced some extraordinary work of literature which truly represented his vision. The elements of islah batin (internal rectification) and tazkiyah nafs (spiritual purification) were deeply engrained in Sheikh Nadwi's character and thinking. This was the result of his close association with the pious and spiritual personalities who meticulously followed sunnah (traditions of Prophet Muhammad) and were endowed with spiritual qualities. This, in turn, had developed in him qualities of zuhd (asceticism from worldly pleasures), istighna (expecting nothing from anyone except Allah), contentment and cognizance of the life hereafter. As a result, he became very endearing to people and his call became quite appealing to them. It has been five years since Sheikh Syed Abul Hasan' Ali Hasani Nadwi passed away and the sixth year is in progress. During this period, several articles and books have been published in both Arabic and Urdu highlighting different aspects of his life. One of them is the biography that Syed Bilal 'Abdul Hai Hasani Nadwi has written. It gives a complete portrait of Sheikh Nadwi's life. Bilal Nadwi is the son of Sheikh Syed Muhammad Al-Hasani (d. 1979) who was a highly gifted and renowned writer of the Islamic world and was very dear to Sheikh Nadwi. Writing biographies of religious scholars and pious people has been a speciality of this family as is exemplified by Nuzhatul Khauiaiir (Arabic) which was authored by Sheikh Nadwi's father Hakim Syed 'Abdul Hai Hasani (d. 1923). Sheikh Nadwi's own autobiography Karwan-e-Zindagi is another extraordinary work in that tradition. In Karwan-e-Zindagi, Sheikh Nadwi has shed light on important events of his life which include the formation and accomplishments of the All India Muslim Majlis-e-Mushawarat, Deeni T'alimi Council, Payam-e-Insaniyat, All India Muslim Personal Law Board, and World Forum of Islamic Literature. He has also covered the tragic events of the invasion of Egypt by Israel and the separation of Bangladesh (from Pakistan). 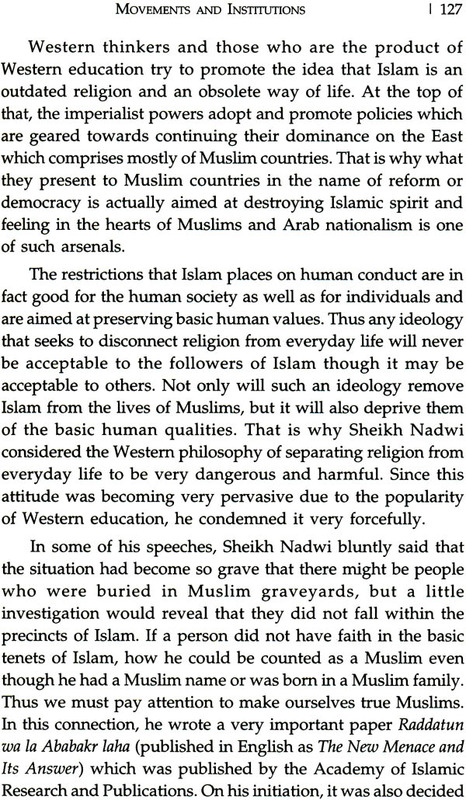 Sheikh Nadwi was very candid in addressing Arabs and his talks were unflattering and unbending. In doing so, he was actually fulfilling an obligation which could very well be legal, moral, or political, but the main driving force was his inner zeal, fervor, and passion that ran through every fiber of his body. There are many who have written about Sheikh Nadwi and have expressed their feelings, love, and respect for him. I also happen to be one of them and have paid my tribute by writing Meer-e-Karwan. But the fact is that the person who could have written most forcefully and eloquently about Sheikh Nadwi could be none other than Sheikh Syed Muhammad Rabey Hasani Nadwi. May Allah bless him to serve for many years to come! Sometimes, it occurs to me that he is actually a true replica of Sheikh Nadwi. Now his look also has become like that of Sheikh Nadwi. One of Allah's special favors to Sheikh Nadwi was that He gave him a successor like Sheikh Rabey who is indisputably his true heir. Thus my inner desire was that Sheikh Rabey should have written about Sheikh Nadwi. What others have come to know secondhand, Sheikh Rabey had witnessed them with his own eyes. People have heard that the qualities of selflessness, serving deen (Islam), and sacrificing everything for it had come in Sheikh Nadwi because of his mother's upbringing and supplications. For Sheikh Rabey, it was not a matter of hearing these things from someone. Rather, all this was happening right in front of his own eyes in the home of his grandmother (Sheikh Nadwi's mother) who used to remain engaged in dhikr (remembrance of Allah), long d'ua (supplications), and tahajjud (pre-dawn prayers). Sheikh Rabey was with Sheikh Nadwi at all times, whether at home or in journey. He represented Sheikh Nadwi on many occasions and spoke on his behalf many times. If Sheikh Nadwi accepted any responsibility, it was Sheikh Rabey who was to implement it. Sheikh Rabey did not write this biography in a conventional way. Instead, he dictated little by little his account of important events which he had personally observed and experienced. Thus the book that you have in your hands is a collection of those recounts. I do not mean to belittle what others have written on Sheikh Nadwi. In fact, everyone has done so with full affection and regard for him. No one was forced to write and everyone has expressed his feelings and observations in his own unique way. Nothing is redundant, as a poet has said: "Every flower has its own color and fragrance". In the last five years, many articles, books, biographies, both in Arabic and Urdu, have appeared and more are still coming. In the second chapter of this book, Sheikh Rabey has presented an excellent picture of Sheikh Nadwi's early life. Mentioning all the prominent persons who were born in the family since 1857, he has written that Sheikh Nadwi's maternal side, despite being zamindar (absentee landowners) and well off from the worldly point of view, was firmly committed to religious values and practices. Thus both zamindari (landlordship) and religiousness were going on hand in hand and the family was able to inculcate in its members qualities of piety, modesty, d'awah (calling people towards Allah and His divine religion), sacrifice, supplication, spiritual purification, and humility. It was as if both these streams were merging into each other. If I could, I would rephrase Sheikh Rabey's analysis in the words of Shah Waliyullah Dehlavi (d. 1762) that both the material and spiritual forces were working together in the family with proper balance and without any conflict. The clay with which Sheikh Nadwi's skeleton was kneaded had neither the element of monasticism of hermits and monks nor the element of endless greed of worldly people. All the biographers of Sheikh Nadwi agree that the factors that played a role in the formation of Sheikh Nadwi's personality are the upbringing of his mother, teaching of Sheikh Ahmad' Ali Lahori, d'ua of Sheikh Syed Hussain Ahmad Madni, recognition of his potential by Sheikh Ashraf 'Ali Thanwi, spiritual mentoring of Sheikh Muhammad Ilyas Kandhlawi, Shaikhul Hadith Muhammad Zakariya Kandhlawi, and Sheikh' Abdul Qadir Raipuri and affection and d'ua of many others including Shah Muhammad Wasiyullah Fatehpuri, Shah Muhammad Yakoob Mujaddidi, and Sheikh Muhammad Ahmad Phulpuri of Partapgarh. All these factors, with the blessings of Allah, culminated into the versatile personality of Sheikh Nadwi. Sheikh Rabey has written nearly the same thing; his assessment is of course most authentic as it is a matter of his own home and he has witnessed all of these with his own eyes. However, my own humble opinion is slightly different. In my view, the outward and inward training of Sheikh Nadwi's mother and older brother Dr. Syed 'Abdul' Ali Hasani turned him [from raw material] into a piece of gold and precious gem. He then became the focus of attention of all the eminent jewelers and diamond makers who were blessed with the skill of polishing human character and personality. As we have read, Shaikhul Hadith Muhammad Zakariya Kandhlawi, Sheikh Muhammad Ilyas Kandhlawi, Shah Muhammad Yakoob Mujaddidi, and Shah Muhammad Wasiyullah Fatehpuri spotted Sheikh Nadwi's talent and potential in their very first encounter with him and he became very close to them in a very short period of time. What was the reason? Sheikh Nadwi's mother planted the seed of worthiness in him and his older brother nurtured it. Then wherever he went, he bloomed into a rose. Sheikh Rabey has written all this in his own elegant way. I have expressed it in my own rustic way. Nevertheless, these were the factors which played key role in shaping the personality of Sheikh Nadwi. When Sheikh Nadwi opened his eyes, he found himself as a member of the family of Syed Ahmad Shaheed (d. 1831) whose feats and accomplishments were still inspiring Muslims to sacrifice their lives for the sake of Allah. It was in fact Syed Ahmad Shaheed from whom Sheikh Nadwi inherited the zeal for d'awah and tabligh (propagation) and the understanding that they (d'awah and tabligh) must be plain, simple and free from any pomp and show and must reach kings as well as paupers. Sheikh Nadwi addressed Shah Saud and Shah Faisal of Saudi Arabia, President Ziaul Haq of Pakistan, Shah' Abdullah of Jordan, Shah Hasan of Morocco as well as poor peasants of the villages of Lucknow and gave them d'awah. When addressing someone, he used the method that was most appropriate to the level of understanding of that person and attempted to infuse the divine message of Allah in that person's heart. His strategy of working in India was same as that of Mujaddid Alf Thani (d. 1624) whom Allah had enabled to foresee the danger at the right moment and steer Muslims of India to preserve Islam in their lives.